The C340 is a manual machine featuring a low force handle for your punching. The GBC CombBind C340 is ideal for small offices, combining a punch capacity of up to 25 80gsm sheets with a binding ability of up to 450 sheets. 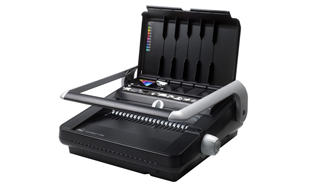 It binds A3 portrait, A4 or A5 sizes, includes auto-centering, paper separator and a full-width handle to make paper punching smooth and easy. • Binds up to 450 sheets using a 51mm comb. • Document Separator - Divides your pages into punchable quantities. • Perfect Pages - The Auto edge feature ensures there are no ugly paper break outs at either edge. • Automatic Centering of Pages - The ‘auto centering’ feature positions the pages for perfect punching. • Solid construction provides longer life and greater durability. Interested in the GBC CombBind 340?